Agios Nikolaus (or ‘Ag Nik’) is a smaller resort 40 miles or so east of Heraklion. 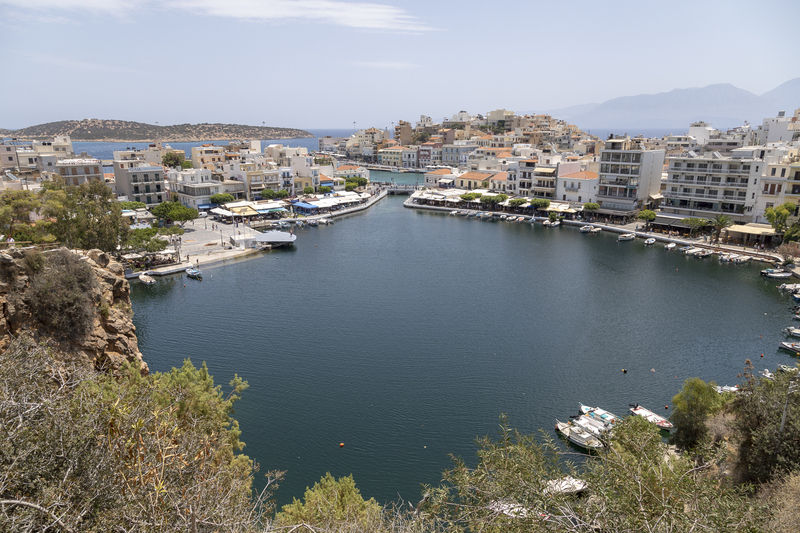 I’d read about it, and the guidebook suggested that it was perhaps one of the prettiest harbours in Crete. So I decided to take a look, and took a ride on the KTEL bus. The journey took about 90 minutes, and the bus was pretty full both ways. I’d seen some pictures of Agios Nikolaus and it did indeed look attractive. One thing I hadn’t understood was that the waterfront area (which consists of an outer and inner harbour, a marina, and a couple of public beaches) is surrounded by steep hills. The only way from the bus station would be over one of these hills, and indeed moving around the town seemed to involve hills quite frequently. In the Cretan sunshine this wasn’t the best news, and somewhat dampened my enthusiasm for the place. The harbour is indeed very attractive, and is of course surrounded by restaurants and bars. I had a meal here, and for the first time on this holiday I had to order water with a meal – I’d got used to having a bottle of chilled tap water magically appearing. Certainly a glass-full… but not in this place, so I had to order a bottle of mineral water. Having eaten I explored. I was trying to not have to climb the hills too often, so I walked up a street called Sfakianaki which apparently led to a beach on the actual coast. Even this had a bit of a hill, but soon enough I was looking at the beach. Then I followed a path to the right which would take me along the coast to the marina. Well, it did, and the stretch of coast path was attractive, but the marina was a disappointment. It’s just a series of yacht mooring stations; there’s no activity around them at all. I did enjoy one area, and that was what looked like a boat repair yard, or at least an area where boats that needed repairing had been beached. One boat in particular took my eye – wooden-built and in traditional style. I was able to walk around it (not on board) and take some pictures.